View More In Cheese Servers. Cut & Serve Your Favorite Fromages Like In The Most Exclusive Wine Bars & Restaurants! Looking for a practical, durable and beautiful cheese board set? Need an all-inclusive cheese board and knives kit for your wine tasting nights? Want to dazzle all your friends with your eye-catching cheese cutting and serving board? Presenting The Ultimate Cheese Serving Tray & Cheese Knives Gift Set By Greener Chef! Our premium natural bamboo cheese platter board is here to help you dazzle your loved ones and enjoy your favorite cheeses like never before! Why Choose Our All-In-One Cheese Enthusiast's Gift Set? Unparalleled Quality - indulge yourself in the magnificent quality of our natural bamboo cheese serving platter, which is not only eco-friendly, but also extremely durable and sleek. 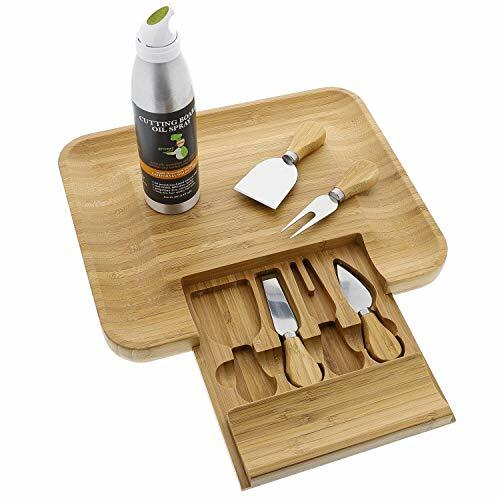 All-Inclusive Cheese Board Set - that includes 4 special stainless steel cheese knives, a premium conditioning oil spray and a luxurious gift box. The perfect housewarming gift or wedding gift! Ideal For All Cheese Types - cut, serve and present your favorite Mozzarella, Parmesan, Provolone, Brie, Cheddar, Edam, Gouda, Blue Cheese, Feta, Monterey Jack, Camembert, Pecorino Romano, Gorgonzola, Ricotta, Halloumi or any other fromages you like. Multipurpose Design - you can use our charcuteries to serve appetizers, cold cuts, ham, bacon, fruit, crackers, nuts or any other snack you and your guests like. Entertain Your Friends Like A Pro - if you are planning a wine tasting night with your friends, our large cheese tray and knife set is exactly what you need! Click "Add To Cart" NOW & Get Your Cheeseboard & Cutlery Set 100% RISKFREE! IMPRESS ALL YOUR FRIENDS WITH THE MOST ELEGANT CHEESE BOARD and enjoy amazing moments of cheese and wine tasting with your loved ones. The Greener Chef premium cheese board and knives set is here to help you dazzle your friends thanks to its beautiful and eye-catching design. What are you waiting for? HOST THE MOST UNFORGETTABLE WINE & CHEESE TASTING NIGHTS thanks to our elite cheese and charcuterie board, which is made from 100% natural and eco-friendly bamboo. Now you can cut and serve your mozzarella, brie, cheddar, Parmigiano- Reggiano, gouda, stilton, gorgonzola, Roquefort or feta cheese like never before. A MUST HAVE CHEESEBOARD SET FOR EVERY CHEESE EXPERT who wants to enjoy his/her favorite fromages like a pro. Our cheese platter board set comes with 4 different cheese knives (1 x chisel, 1 x spreader, 1 x semi-heart shaped knife and 1 x cheese serving fork) so you can cut, spread and serve your favorite cheeses. PROTECT & CONDITION YOUR BEAUTIFUL CHEESE SERVING TRAY with our professional-grade conditioning 100% walnut oil spray, which will restore your cheese platter's natural colors and shine while maximizing your cheese plate's durability. As a result you will be able to protect your investment and keep it as good as new. SURPRISE YOUR LOVED ONES WITH A MAGNIFICENT GIFT! We all have a friend who loves cheese and this all-inclusive 13" x 10.5" cheese serving tray set is the perfect housewarming gift or wedding gift idea for every cheese enthusiast. Spoil your wife, husband, friends or parents with the Greener Chef bamboo cheese platter set today! If you have any questions about this product by Greener Chef, contact us by completing and submitting the form below. If you are looking for a specif part number, please include it with your message.